Be picked up at lobby of hotel in Taipei City and drive to Sun Moon Lake which is located in the middle of Taiwan and situated 762 meters above sea level in the lofty mountains of Central Taiwan. Tour will stop at the famous Wenwu Temple, also known as Literature-Warrior Temple, dedicated to Confucius as Master of Pen and to Kuan Ti as Master of Sword, Holy Monk Shrine and Ci En Pagoda. After touring round Sun Moon Lake, check in at hotel. Enjoy natural hot spring at the Fleur de Chine Hotel, Sun Moon Lake. You can also enjoy the walking trails, biking, hiking or boating at the lake after hotel check-in. Breakfast at hotel with a pleasant morning leisure at hotel on your own until 10 AM. Check out of hotel. The Tour will continue passing by the lovely small and old Jiji Railway Station, drive to Fo Guang Shan Buddhist Monastery, the most famous Buddhist sacred place of southern Taiwan. Here you will learn about Buddhism during the monastery walking tour and communicate with some of the monks and nuns during the visit. There will be the opportunity to taste Buddhist vegetarian lunch (at your own cost). After lunch, we will drive to Kaohsiung City, which is the second largest city of Taiwan. The tour will take you to Love River and Liuhe Night Market. Overnight stay at Kaohsiung. Breakfast at the hotel, check out and enjoy the morning tour to Kenting National Park, located at Taiwan’s southern tip and the 37 miles of coral-rimmed shoreline along three sides of the park provide its main attractions. Stops will be made at Eluanbi light house, Maobitou coastal scenic area and Longpan Park. The Tour will continue with a drive to Taitung via Southern Link Highway. Overnight stay at Zhiben. Enjoy natural hot spring at Hotel Royal Chihpen. Hotel: Hotel Royal Chihpen, Taitung (5*) or similar. After breakfast check out of hotel and look forward to the exciting East Coast Tour. The East Coast National Scenic Area, known as “Taiwan’s last unspoiled land”, stretches 170 kilometres down the east coast of the island. Weathering, erosion, and accumulation have produced a wide range of landforms here. Our tour will stop at Xiaoyeliu, Sanxiantai, Shitiping (Stone Steps), marble factory and showroom. After breakfast and checking out of hotel we will make a visit to Taroko National Park. Taroko Gorge is an exceptionally beautiful, narrow raving created by the Liwu river which has cut deep into the mountains of solid marble. A road carved into sheer walls of rock rewinding its way past forested peaks and cliffs towering thousands of feet above it, while hundreds of feet below a river roars past gigantic marble boulders. Stops will be made at Ci Mu Bridge, Swallow Grotto, Changchun Temple and Shakadang Trail. We will then drive back to Taipei with a stop at Qingshui Cliff, drive through Syue-Shan Long Tunnel (12.9 Kms) to arrive at around 6 PM. Sun Moon Lake: The poetically lake is the most famous lake attraction in Taiwan. With over 100 square kilometres, the lake got its name because the northern part of it has the shape of the sun and the southern part of it has the shape of crescent moon (those two parts are separated by Lalu Island). “Autumn Moon Scene of the Sun Moon Lake” is considered as the most attractive 12 sights in Taiwan. Fo Guang Shan Buddha Museum: At the north-east of Dashu Township in Kaohsiung county on the left bank of the Gaoping (Kaoping) river, a famous tourist destination is located. Here you will find theBuddhist centre of South Taiwan, established by Master Hsing Yun and his disciples. The architecture of the temples is very characteristic, and at the south-eastern side of Fo Gunag Mountain (Gunag Shan) Monastery the most prominent landmark of the region is found: a huge golden statue of Buddha Amitaabha which measures some 120 meters. Liuhe Tourist Night Market: A visit here is a must. As early as in 1950, more and more stalls came to be stationed in Dagangpu of Xinxing District in Kaohsiung, finally forming the well-known “Dagangpu Night Market”. No matter what you like to have, a variety of delicious food specialties, cold drinks, ices and seafood here are offered for your choice. Don’t miss the opportunity to taste the papaya milk and steamed salty shrimps in Kaohsiung. 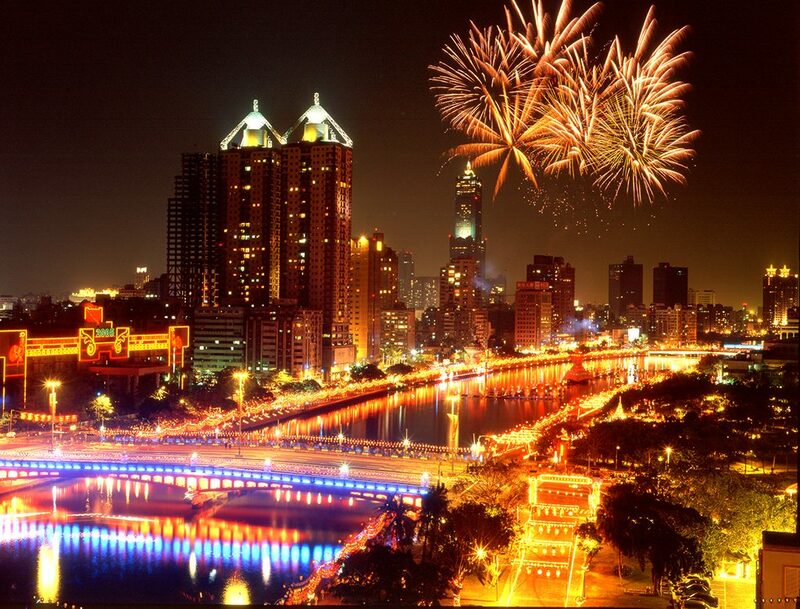 Love River Night Scenery: Almost all big cities have a beautiful river – this is especially true in Kaohsiung. Love River lies across Kaohsiung for times of sunrises and sunsets. Love River, known as Dagou River in Ching Dynasty, was renamed by the Japanese as Takao River.The river was also called Kaohsiung Canal. After restoration of Taiwan, the riverbanks were beautified with greenery and developed to be park areas, decorated with pillars chained with iron rope. The area becomes a romantic place for lovers to date with each other, therefore, the river was reputed as Love River. Kenting National Park: Kenting National Park, which was established on Jan. 01, 1948, is Taiwan’s first National Park. Spanning the Hengchun Peninsula, it faces the Pacific Ocean to the east, the Bashi Channel to the south, and the Taiwan Straits to the west. Some of Taiwan’s largest coral reefs lie off the coast and the forests along the park’s western edge are the last of Taiwan’s coastal tropical forests. The fantastic climate, lush forests, beaches, and reef environments make Kenting a rival to internationally famous tropical resorts like Bali and Phuket. East Coast National Scenic Area: The East Coast National Scenic Area, known as “Taiwan’s last unspoiled land,” stretches 170 kilometres down the east coast of the island from the mouth of the Hualien River in the north to Xiaoyeliu (Little Yeliu) in the south. To the east it is bounded by the Pacific Ocean; to the west rises the Coastal Mountain Range. The land here consists of volcanic rock, classic rock from deep beneath the sea, and shale that has been pushed upward- and is still being pushed upward by tectonic action. Weathering, erosion, and accumulation have produced a wide range of landforms here, including coastal terraces, sand and pebble beaches, shoreline reefs, inshore islands, capes along with sea-eroded platforms, trenches, and caves. This varied topography provides habitat for a rich diversity of flora and fauna. 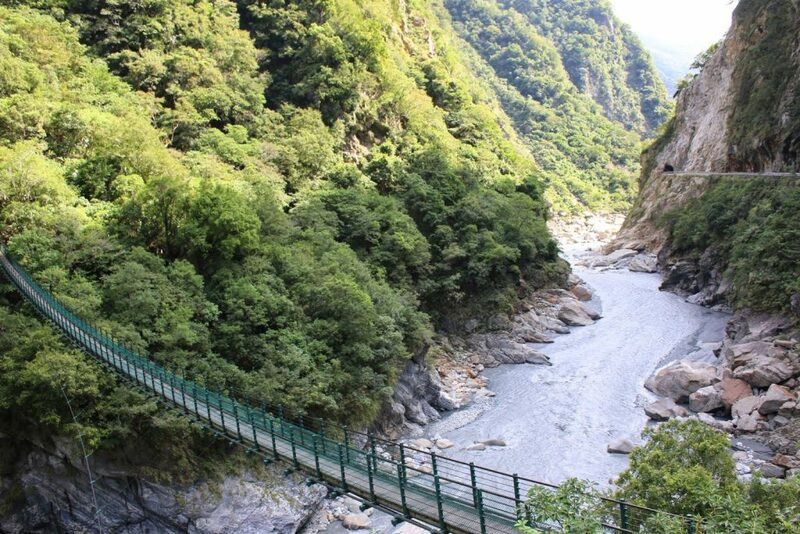 Taroko National Park: Taroko became a national park in 1986, including Hualien County, Nantou County and Taichung City. Taroko is famous for its spectacular mountains and marble canyons. Cliffs and canyons stretch along Liwu River. Four million years ago, the island of Taiwan was formed by the collision of plates. After millions of years of wind erosion, the marble rocks were exposed and cut by Liwu River, creating impressive grand canyons. From Qingshui to Nanhu Peak, the drop height is 3,742 meters. Such special geography has also bred special flora and fauna in this area. Swallow Grotto: Along the Swallow Grotto trail which runs about a half kilometre starting from the entrance to Swallow Grotto to the Jinheng Bridge, you can enjoy the sights of the Liwu River from nearly straight above the water, the potholes on the cliff faces, the springs sprinkled along the lower parts of the walls, as well as the famous rock formation “Chieftain’s profile rock”.